In this edition we will discuss the differences between Stainless Steel and Zinc Plating for Casters and Wheels. In most cases zinc coating on a caster rig, (fork), is sufficient, but there are some applications where stainless steel is beneficial. First off lets go over the two products. Zinc coating is just that, a coating or plating covering traditional steel to resist corrosion or rust. While stainless steel is corrosion resistant on it own, some stainless products are coated as well, but the steel is naturally resistant to corrosion and rust. The stainless steel casters are definitely more expensive but with a cost analysis they may be cheaper in the long run. casters on their carts, cages and dollies because they are washed down with chemicals regularly and often steam cleaned. These industries can also not afford to have the work place contaminated by the rust. The stainless steel is much more resistant to chemicals and steam cleaning. In cases like these, with excessive wash downs and heavy chemicals it may be simply cheaper to spend the extra money upfront, than to replace the rusted casters and wheels on a regular basis. For most cases, zinc plated casters and wheels will be sufficient, even if they get wet on occasion, sit outdoors at times or are indoors. Some applications where stainless may be beneficial would be casters on carts that get cleaned often, or if they sit outside all of the time in inclement weather like snow or excessive rain. 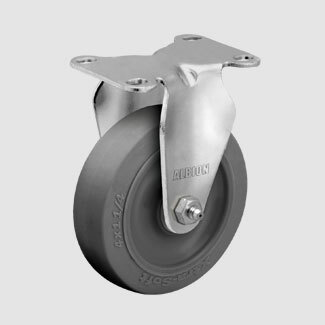 In industrial settings the casters and wheels are generally zinc coated for the equipment they use. Caster & Wheels, What is Light , Medium & Heavy Duty? Caster and wheels are often categorized by their weight handling ability, these categories are simply "Light Duty, Medium Duty, Heavy Duty and Super Duty. To lessen confusion we will define these caster categories to better help you find what you are looking for. Most people will say, " I am looking for a heavy duty caster to replace the ones on my my office chair ". While it is understandable that you are looking for a more durable option, the term heavy duty in our industry would mean something completely different. The light duty category of casters and wheels specifications are as follows. Wheel size; diameter of the wheel is usually between 2" and 5" with a tread width of 7/8" to 1-1/2". The load capacity of Light duty casters is up to roughly 400lbs per caster. So as you can see the "Light duty" can still be very strong and substantial. Typical applications for Light Duty stem or plate mount casters in swivel or rigid would be: Medical equipment, dollies, office chairs, computer carts, Displays and fixtures, Rubbermaid carts and mop buckets, etc. Any cart that has 4 casters and is under 1200lb would qualify as light duty. Usually Rubber, plastic or Polyurethane wheel material. These caster are for industrial uses along with aerospace, foundries and more. The sizes typically range from 4" to 16" in Diameter and 2-1/2" to 4" wide. The weight capacities are up to 20,000lbs each and have options like special tapered bearings and kingpinless casters to Dual wheels. These wheels are usually very large and very heavy so freight shipping may be required. Below are a couple samples of Heavy and Super Duty casters and wheels. Typical Wheel types are Forged Steel, Ductile steel, Cast Iron, Polyurethane on Steel. There are several different styles of stem casters, from industrial applications to food service carts and dollies to furniture and displays. 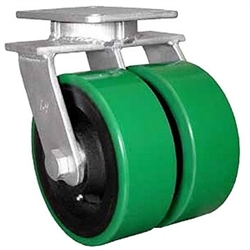 The problem with these casters and wheels is that there are many options and sizes to choose from and it can at times be confusing. Most stemmed casters are also available in stainless steel. Pictured are the styles of stems that are most common. Threaded Stem Casters are the most complex due the size and thread pitch variations available. These are very common but may need some expertise in determining the correct size. See measuring a caster on the BuyCasters.com website. 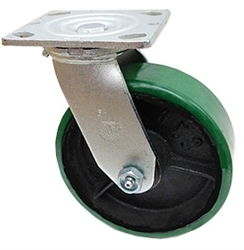 These casters are used on displays, furniture, carts and medical equipment, etc. and is usually used in light duty or medium duty applications. Grip Ring Stems are used on most new office chairs and furniture, seen often on the hooded twin wheel casters for chairs. There are several other applications like Metro Brand Wire shelving, casters for Rubbermaid Mop Buckets and many more. They are designed to fit into a tube or socket and the C-Clip when compressed applies pressure to the tube. Very easy to replace and install. Expandable Adapter casters are commonly used larger round and sometimes square tubing, these caster stems will expand, within a size range, by tightening the collar on the base of the stem and apply pressure to the walls of the tubing. These can sometimes be difficult to install and a wrench is usually required. Often used in Medium duty industrial and custom applications. Grip Neck Stems are not used that often anymore, these stemmed casters are mostly seen on older wooden furniture. This stem needs a socket that is hammered into the legs of the furniture and the caster and wheel snaps into the socket. A common problem for industries that use high temperature applications , (such as industrial, autoclaves, bakeries, paint booths, foundries, etc. ), is what caster and wheel to use that won't be affected by the extreme heat. What type of heat is it, humid or dry? For dry heat we recommend either steel or a high temperature phenolic wheel with a plain bore or roller bearing with high temp grease installed. The Phenolic wheel will offer similar capacities to the steel but won't spark and offer a little better floor protection. 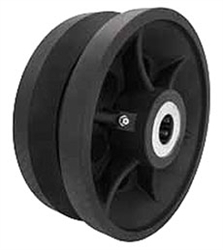 For wet or humid heat applications a high temp glass filled nylon wheel will be perfect. You can use steel wheels but they may rust over time. How long will the caster be in the heat? High temperature casters can be in extreme heat but the but the duration of the heat can lessen the overall temperature handling of the caster, wheel and bearings. For extended extremely high temps and periods of time, a steel wheel with a plain bore will be necessary, there may be some engineering involved to allow for expansion around the axle in harsher circumstances. All of our products will have heat tolerances listed in the technical specs. If you have any questions about your application please visit our website or call one of our knowledgeable staff at 1-855-943-3511. 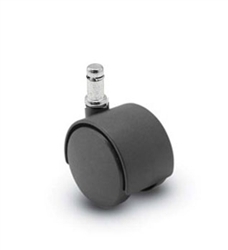 There are several different types of furniture / chair casters, different sizes, colors and styles. 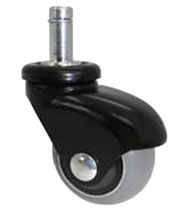 The most common type of chair caster is the twin wheel hooded caster, (Pictured right). The stem on this caster is a grip ring stem 7/16" wide or thick by 7/8" tall and has 50mm wheels (2"). Made out of black nylon. This style caster comes on most new office and desk chairs and for the most part is adequate for the job. If you chair casters have worn out or you are using your chair on hardwood floors, you may want to upgrade to a higher quality caster. We offer several options for your chairs, the wheels recommended for hardwood floors have a caster with a polyurethane or gray rubber tread and will not scratch or leave marks on the flooring. You could get the same style wheel with polyurethane tread or upgrade to a heavier duty style like the one pictured to the left. This is a gray non marking rubber which will roll quietly and not scuff your flooring. While the above mentioned grip ring stem is the most common, there are several types of mounting applications. There is a grip neck stem which is commonly found in older, wooden furniture and usually has a socket that will need replacing. Next is the threaded stem, the most difficult to replace due to the numerous sizes available, measuring is a must height, width and thread pitch is necessary. Lastly the top plate style, measuring is easy and quick as there are only a few sizes available the top plate style is more commonly used on displays and desks. Expandable adapters are used in furniture with tubular legs and piping. Casters and wheels are a essential partner in the food processing and service industries. These casters range from heavy duty to light duty and come in assortment of styles and options. Some of the most common are the non marking gray rubber wheels on a stainless steel caster. This is a quiet, easy to roll, corrosion free setup. With the constant cleaning and spraying down of the carts in the food industry, stainless steel is a logical choice. The standard zinc coated casters will resist rusting but over time will corrode and while the stainless option is more expensive this set up will save time and money in the long run. Another popular one is the high temperature caster and wheel, phenolic or nylon, these wheels will withstand extremely high temperatures, perfect for ovens, autoclaves and steaming. The high temp nylon wheel is perfect for high temps that have a high humidity level or wet applications, the Phenolic is better in dry heat. The bottom line is that casters are a fixture in the food industry, whether food service carts, dollies, kitchen and bakery racks, equipment or cleaning and service carts like Rubbermaid. Whatever your needs high quality casters and wheels are a must. But the proper application for each casters is paramount. Contact our caster specialists and let them assist you in finding the right casters and wheels for your application. 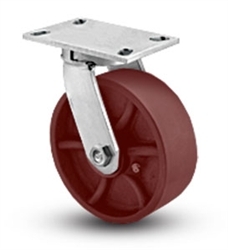 V-Groove caster wheels are commonly used in heavy duty industrial applications. They are made of steel / cast iron, Ductile steel , drop forged steel, polyurethane and nylon. The most common is the cast iron aka semi steel, these are economical and have great capacities and and durability. V groove wheels are specifically made for riding on inverted angle iron track but can be also used on flat surfaces. The "v groove" in the wheel allows for load equalization while running on the track. These wheels, depending on the size, can handle loads up to 3500 lbs per wheel, they have a tensile strength of 30,000 psi, and can handle temps from -40f to 600f. An excellent high quality option that have been put through rigorous tests to handle the abuse and heavy duty applications of today's industrial and manufacturing industries. Offered with several bearing types, roller and tapered bearings are the most common. V-Groove wheels are the perfect solution to keeping those heavy duty carts and dollies safely on track.